- In a large pot, put the smoked pork in plenty of water. Cover with a lid, and boil for about 3.5 hours We want to cook the meat until it starts to fall off the bone. And we keep it covered to prevent a lot of the water from evaporating. - Separately, we need to boil the beans (I usually use a 1 lb bag of navy beans). In Romania, the water in which they boil needs to be changed several times to help eliminate the gases. And it seems to work, so I do it. So, put the beans in water and bring to a boil. Completely discard the water, replace it with fresh cold water, and repeat the process several times. The magic number in Romania seems to be 3, but I usually do it 5 times. - Separately, shred the carrots, parsnip, and squash. Also, dice the tomatoes, bell pepper, and half of the red onion. They will contribute a delicious natural flavor to the soup. - Once the meat starts falling off the bone (you can easily remove it with a fork and a blunt knife), figure out how much water you want to keep - and you want to keep some of the water that the smoked hocks boiled in, as it has a great flavor. If you keep more, you'll end up with a Smoked Pork Hocks with Beans Soup. 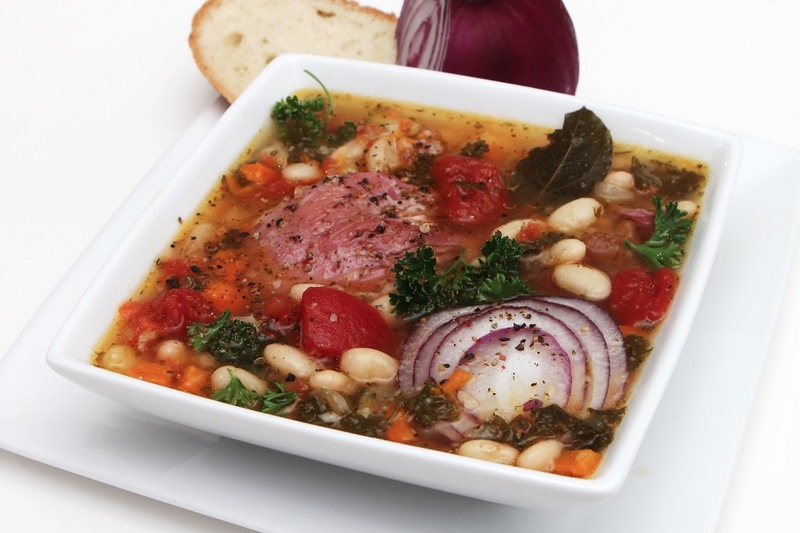 If you keep less (about 7 cups), you'll end up with a Smoked Pork Hocks with Beans Stew. You'll also end up with a stew if you continue the steps following for longer, and allow more water to evaporate. That's my favorite process, as it also turns the beans a bit mushy and the sauce slightly thicker. - Add the beans (after having discarded the final water they boiled in) and the vegetables to the hocks and the water. Also, add the spices: salt, pepper, and chili pepper to taste, about 3-4 bay leaves, and some 4 tablespoons of thyme. - Cook together for 20-30 minutes, or until the most of the water evaporates and you have a thick sauce for the stew. - Once it is ready, remove from heat, add the chopped parsley leaves, mix, and cover. - Serve next to toasted bread and red onions. Feel free to further top it with chopped dill or parsley and finely-diced red onions for an improved presentation. Serve warm. And enjoy. Arata fantastic! Nici nu vreau sa ma gandesc la gust! It looks scrumptious and I'm getting the groceries today! I research international cuisine and try to feature 2-3 countries per month for my family. This will definitely be "Romania Night!" Hi Fellow Foodie from South Dakota. Hope you enjoy your Romanian night, and please let me know how it turned out. As a note, we've been making this more recently with smoked turkey legs, which are a bit easier to find. Enjoy! Where we live I had trouble finding the smoked pork hocks until one day recently I discovered them in the freezer section of our local store. I never thought to look in the freezer for cured meats! My husband is Romanian and this is one of his favorite meals. I enjoy cooking many Romanian recipes taught to me by my mother in law. This is one of my favorites as well, Karen. Which of the Romanian specialties do you enjoy most yourself? Lettuce soup? I've never tried that - please let me know if you can share your recipe for it. Where did you find pickled tarragon? I've never heard of that. By the way, we use lima beans instead for that recipe - would those work better for you? Place in jar with lid and place jar in sunny window. Shake to mix everyday for 2 weeks. Then it's done. My husbands family adds some leaves and some of the vinegar to most sour bean soups and stews. And I do like Lima beans so I'll have to give that a try sometime. My husband said he does like the tripe soup and that I'd probably like it as well so I'll be making it sometime soon and I will use your recipe as I've never made it before. We'll also give the pickled tarragon leaves a try. Good luck with the Lima beans and the tripe soup, and do please let me know how they work out.